Rama said "Oh Sita, you represent purity at its highest, but you have lived under the shelter of Ravan. As a king, I am answerable to my people, and therefore, I would like you to prove your purity in front of all (publicly) so that in future people on this earth would not cast doubt, dare not put any blame of infidelity on your noble character." "Oh my lord, we BOTH were separated for an year but I alone will prove purity of my character by passing through the raging fire flames" saying so Sita entered the sky high raging flames. She remained in fire unscathed and unharmed, her face shining with divine luster, the raging flames reduced themselves to ashes and turned into lotus flowers. Now Sita asked "Oh my lord, there will always be some one who cannot be satisfied by any 'test' or any proof, for they do not want to get convinced and will raise doubts about the Truth itself. Then should I continue to pass the test every day or will you make your own judgment and act accordingly." Rama said "I am a righteous king, as the caretaker of all, not only in matters of food and shelter, but also regarding their emotions and conventions, I am always accountable and need to set an right example for generations to follow, so if the question arises again unfortunately I might ask you for another agnipariksha". Sita already knew Rama would say so, she thought after living a righteous life she had no strength to face this humiliation again from the one whom she unconditionally loved and worshipped. Sita with great grief prayed to Mother Earth to make room for her so that she could find peaceful rest for sometime in her life, the Earth separated into two and Sita buried herself under the protective cover of her Mother. Write Tribe Festival of Words – Day 1 - A 9 sentence fiction. P.S: I don't intend to hurt anyone's religious beliefs, its just my opinion purely fictional. Thank u so much ... I feel so relived after reading ur comment. Sitayana-- wow what a way to describe the epic. A twist in the story of Ramayana depicted so naturally !! A nice narrative. Thanks Usha, and yes this is what I perceive could have Sita'a natural reaction thinking from a women's perspective. After Sita's agnipariksha, Rama finally accepts her and all return back home.Then Ram was given his due honour as King of Ayodhya. "O Noble king, as a perfect master you should always lead the most ideal life, above any reproach. There should not be darkness under the lamp!She must be deserted or banished. Sita has stayed in the custody of Ravan as a prisoner." " What proof she has to prove her innocence and purity! Who will believe her? It will be better if you leave her. It will be in conformity with the noble tradition of Raghu Dynasty, as well as a just gesture on your part as the king of Ayodhya. Ram passed many sleepless nights. Sita was carrying his two sons in her womb. 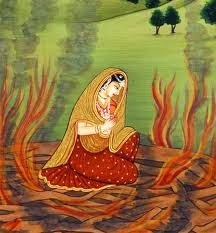 She was innocent, Ram knew and believed. But as a righteous king, as the caretaker of all, not only in matters of food and shelter, but also regarding their emotions and conventions, he was accountable. Ultimately, Ram decided to desert Sita, the Purity personified!!! One humble Rishi was already briefed about Ram's decision. The sage was pleased to receive Sita and promised every care for her health. Sita gave birth to two lovely sons: LAV and KUSH. Ram was distressed. His golden rule and prosperity of his people, his Ram-Rajya meant little to him now; the episode of Sita hovered constantly over his heart. The folly and compulsions of authority and social welfare became clear to him. One day, all alone he drowned himself in the holy waters of river Sarayu. Sita was always misunderstood and wrongly asked to proved her purity. But nowhere in the Ramayana has she asked Rama to prove his fidelity which is unjust. This post has made Sita question what a modern day woman would have questioned. A brave , bold and interesting post. Thanks Kalpana ! In last few days, I read hundreds of posts which all give various reasonings for why sita took the agnipariksha (maybe I should write another post about it), but not one tiny question or thought raised against Rama's Chastity. I appreciate your comments, its a great source of encouragement when understood by a reader. It seems an oft-repeated saga for women, no? I guess all scripture and mythology too was controlled by men! Sad but might be true ! Lovely rendition from Sita's perspective. You should read Sita , a graphic novel by Saraswati Nagpal. Brilliant book. Thanks Shailaja , I didnt realize CAPTCHA was on I will immediately turn it off and I appreciate your suggesations. Nicely narration. I always feel that Rama is not the Maryada Puroshotam and according to me is a weak man, for not trusting his wife and listening to people. I would love to read Sita's perspective in Ramayana. Thank you ! Yes it was indeed sad that after proving her chasity publicly, still rama was affected by rumors and society's opinions and banished Sita, who was then carrying his child. A story which still makes me feel that the realities of religion and mythology often escape us. This was in my words a most disrespectful thing for a woman to be accused of.. Yes Richa, a sad reality which is so rarely spoken of ! Yes questions which are never answered nor encouraged. Yes ! Till date this has been the most difficult post for me to write. This twist-in-a-tale engulfs one of the biggest facts of Ramayana, and that's existence of Luv-Kush!